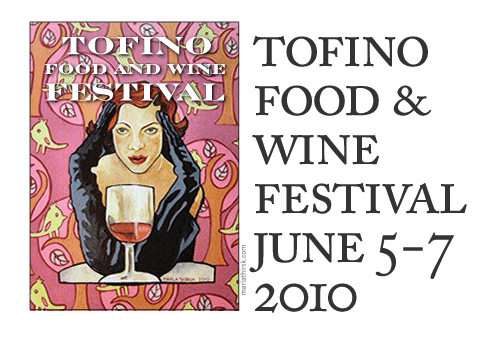 The idea for a festival celebrating the marriage of food and wine in the unique setting of a temperate coastal rainforest was, and still is, strongly supported by the community of Tofino, as well as Vancouver Island purveyors and British Columbia wineries. This festival provides cultural and educational experiences for food and wine lovers from all over, as well as an opportunity to discover sustainable British Columbia food sources. With a showcase of local culinary talent, the festival also provides networking opportunities for cuisine and tourism establishments to form new business relationships and alliances. The Tofino Food & Wine Festival also hosts a Silent Auction Fundraiser at the main event, specifically for the Tofino Community Children's Centre, an invaluable service for local families providing much needed child care and healthy structure for our children. The centre, operated under the umbrella of Tofino Parks & Recreation provides an enriched program for children attending the centre. The festival also promotes education and professionalism in the hospitality industry, promoting culinary and sommelier programs as well as Slow Food, a non-profit, eco-gastronomic member-supported organization dedicated to recognizing the importance of pleasure connected to food in conjunction with agricultural biodiversity. Celebrating 10 years of Pinot Noir, Alderlea Vineyards winemaker Roger Dosman will showcase a vertical tasting paired with a Burdundian dinner by Chef Joel Aubie. An intimate and exclusive event, not to be missed. Maximum 20 seats. 100% of proceeds will benefit the Tofino Community Garden. For more info call 250.725.3353. Join Howard Soon, winemaker for Sandhill Winery for an exclusive dinner at the Wickaninnish Inn. Paired with a multi course meal by Chef John Waller and Chef Nicholas Nutting of the The Pointe Restaurant. For more info call 250.725.3100. Watch the sun set over Vargas Island from a deck at the Shore overlooking Tofino Harbour and Clayoquot Sound. Savour locally prepared seafood tapas from Trilogy Fish Co and Pentlatch Seafood's Komo Gway Oysters. Sip Sperling Vineyards wines, poured to accompany the Festival Partners delicacies of the seafood being served. Limited to 40 guests. For more info call 250.287.6345. Spend a the afternoon wandering the Tofino Botanical Gardens while tasting canapes and wines, all local to beautiful British Columbia! Live music with Dinah D Swingclub from Gabriola Island, DJ Kevin West, silent auction fundraiser, artists in action and more. Outdoor event, rain or shine! Car free event. Shuttle Service provided by Tofino Bus in partnership with the Wickaninnish Inn. Relax on the outdoor patio of the fetch restaurant. The Chicken and the Eggs, Hosted By Professional Food Lover Bobby Lax In this class we will reconnect the chicken to the eggs they produce. It will split time between utilizing the whole chicken and discovering the amazing versatility of eggs. For anyone who is bored of boneless, skinless chicken breast and would also like to learn a few quick tips to better egg cookery this will be the class to come to. For more info call 250.725.3229. The 8th Annual Tofino Food and Wine festival is a joint fundraiser for Tofino's Children Centre and the Tofino Botanical Gardens.